Conference Center – Now Open! See below for CRASHs Court, Supportive Services for Veteran Families (SSVF), Tulsa Alternative Courts, Tulsa Reentry One-Stop, and Youthful Drunk Driving Programs. 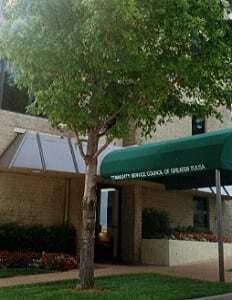 The Community Service Council administrative offices are located in the Main Square Towers building, on the southeast corner of 16th and Main Streets, between 16th and 17th Streets, and between Main and Baltimore. SSVF, Tulsa COURTS Programs (including CRASHs Court and Youthful Drunk Driving Program), and Tulsa One-Stop Reentry addresses are below. THE CSC CONFERENCE CENTER entrance is located on Baltimore Street under the green awning (pictured to the left). Our MAIN OFFICE entrance is located on 16th Street. CSC main location offices and meeting rooms are on several floors; please come to the reception desk inside the 16th Street entrance for directions within the building. Free parking is available in the lots just north and south of the building, and on the street on 16th and on Baltimore.